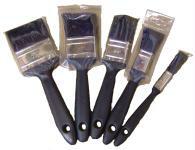 High quality pure bristle paint brushes. After tests we found these to perform better than Hamilton & Acorn Super Contractor brushes. 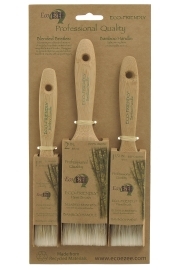 EcoEzee Handcrafted brushes - The handle is made from bamboo and has a mix of natural and synthetic bristles. These brushes offer execllent results and are long lasting, designed for use with all paints, varnishes, lacquers, oils and stains. 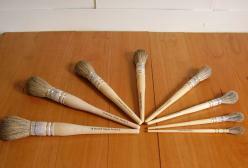 This hand made high quality brush is firmer that the squirrel mops but not as soft. Made from bear hair it produces a wonderful finish. 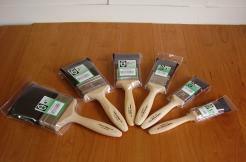 The finest quality brush available, it is designed to apply thin coats of shellac polish. If cared for properly this hand made brush should last many years. For fine detailed colouring use the finest Winsor & Newton Sceptre Gold Pencil Brushes. Designed specifically for glue application it maintains its shape ensuring accuracy. Ideal for applying lacquer when spray equipment can not be used. Do not leave lines. To view the rest of our brushes please click on drop down list. Cheap one use, throw away brushes.